ANTRIM captain Declan Lynch believes Sunday’s game against Wexford is now a “must-win” for both teams following their opening round defeats last weekend writes Paddy Tierney. It was nearly the perfect week for the Lámh Dhearg clubman who hailed it has “an absolute honour” to be given role of the captain for the 2019 campaign. 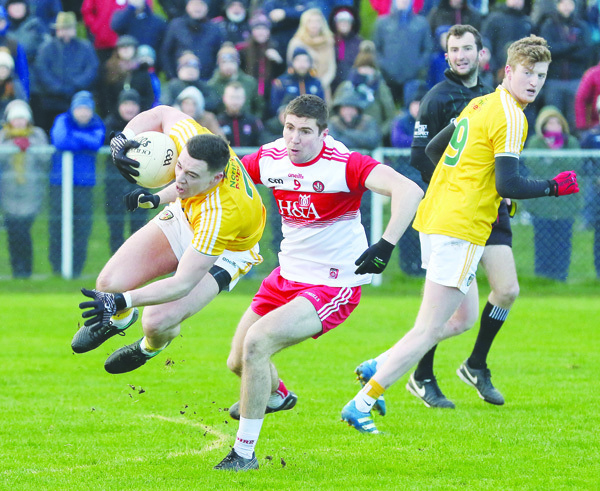 He almost led his side to a memorable result against the Division Four favourites, but Padraig Cassidy conspired to deny Antrim with a late winning point. It was the last score in a low-scoring, yet enthralling battle and Lynch saw enough in Antrim’s performance to be confident ahead of this weekend’s clash with the Model County. However, he warned that the Saffrons must be braced for a backlash after Wexford’s promotion ambitious were dented by Sunday’s surprise 3-15 to 0-11 defeat to Leitrim in Carrick-on-Shannon. “Firstly, it is an absolute honour to be asked to captain the county,” stated Lynch. “To be picked for your county is a massive achievement. To be selected as captain is an honour, only a handful of people get that opportunity. “We were written off against Derry, but knew ourselves we were right going into the game. A few simple mistakes on our behalf cost us the game. We’ll try to iron those out at training this week. Unforced errors cost us the game. “We were gutted to lose the game in that way. Our focus has to shift to Wexford this Sunday. We have to win and we are well capable of winning. We have to bring that same level of intensity and work rate and just improve our decision-making and our passing. “Wexford got beat by Leitrim which nobody really expected to happen. They are going to be stung and we’ll get a response from them. It may only be the first weekend in February, but neither team will want to be pointless after two rounds and Antrim only have two more home games following Sunday’s defeat to Derry. While they will be confident of defeating both London and Wicklow in Corrigan Park, they will need to gain at least four points on the road to put themselves into contention. A defeat at Wexford Park wouldn’t be a fatal blow for Antrim, but it would greatly reduce their margin for error. In such a tight division, the Saffrons will want to get off the mark sooner rather than later and they showed enough against Derry to suggest they have the stomach for a dogfight. ANTRIM’S hurlers will aim to get off the mark in 2A of the National Hurling League in Navan on Sunday when they take on a Meath team who will also feel they left something behind them on the opening day writes David Mohan. The Royals had to be content with a share of the spoils in Mayo on Sunday with two late points giving the Westerners a 0-17 to 0-17 draw, but that one point is more than Antrim gained on Saturday when a stirring fightback wasn’t enough against Kerry at Corrigan Park as they fell to a 1-21 to 2-16 loss with Nicky McKeague and Keelan Molloy sent-off. The 2016 Christy Ring Cup final saga between the counties will be remembered with quite some time with Meath emerging victorious in a replay after extra-time, but the Saffrons did respond with a handsome win in Navan during last year’s Joe McDonagh Cup. Still, there can be nothing taken for granted this Sunday with many of Neal Peden’s young charges still finding their feet at inter-county level, although they showed enough character and desire in defeat on Saturday to show they will be up for what is likely to be another dogged affair. ‘We met them down in Navan last year so we know it’s going to be a tight affair,” he said. “Meath will come out all guns blazing and will see it as an opportunity at home. Their expectations will be high. Even in defeat against Kerry last week, there were signs of life for Antrim who will hope to welcome some experienced heads back this weekend with Simon McCrory expected to resume training after picking up a hamstring injury during the Keogh Cup, while Tomás Ó Ciaráin could return with St Gall’s’ All-Ireland campaign over. McKeague will definitely be out following his straight red, while the Cushendall contingent are still preparing for next week’s All-Ireland semi-final against St Thomas’ and Joe Maskey has an All-Ireland Intermediate football final with Naomh Éanna next weekend also. Still, Peden is hoping the game against Kerry will bring the new faces on as he is forced to place his trust in them for now as they get to grips with the unforgiving surrounds of inter-county action. “There were six or seven debutants and I think nine hadn’t played National League Hurling before,” he noted. “The League is a dogged affair and a different type of hurling than the summer. The ball, sticks, the wee touch maybe isn’t there to get away and you’re going to get nailed, but they learn from those nailings and we have to be positive about these young fellas.